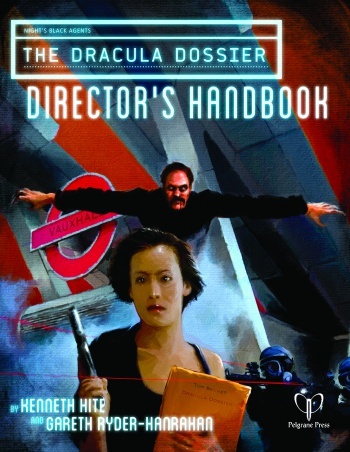 Gauntlett: Describe the Dracula Dossier for the uninitiated. 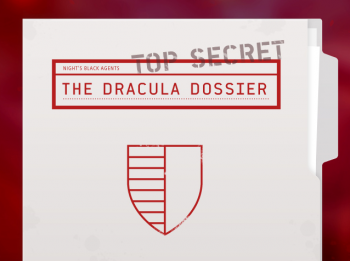 Hite: The Dracula Dossier is an improvisational, collaborative campaign for Night's Black Agents, which means that the players will find their own way into the large body of mystery, and the Director or GM will then pull things out of the source material, to run whatever danger the players have pointed themselves towards. The Director will continue to build a scene ahead of the players, as they follow up on the clues that they have decided are the plot, a kind of Choose Your Own Adventure. As these things do, the bureaucratic organization assembled to recruit Dracula took on a life of its own and became Operation Edom, which is eventually absorbed by MI6. Edom sees this as a chance to feather its bureaucratic nest egg, and possibly prepare to do another deal with Dracula. Nobody quite knows what it is or its true extent; that's one of the campaign mysteries the players can uncover. So in 1940, when the British are desperate to keep Romania out of the Axis, someone says 'We can revive operation Edom from 1894, and we could have Dracula join us as the ruler of Romania against the Axis.' Of course that went about as well as you might expect. The survivor of that SOE mission into Romania writes his annotations into that first draft of Dracula. Then, in 1977, a leak from MI6 into the Romania Securitate [Directorate for Internal Security] gets uncovered. MI6 is trying to hunt it down, and Operation Edom is like, 'Oh. You know what? That might have happened because we had a Romanian running around in London who could control minds and create immortal servitors.' Another analyst finds the Dossier, adds his own annotations, and goes one step further, putting a trigger or flag in M16's computer mainframe so that, if anyone tries to recruit Dracula again, that original document will be forwarded to other intelligence analysts, blowing the gaff on the Dracula scheme. Well, in 2011 enough chatter has built up that the document drops into another analyst's hands, and sure enough, they start looking into it. Right after 7/7 [suicide bombings in central London] MI6 is like, 'No, seriously, ANYTHING is on the table,' and Edom says 'We've got anything; we've got a 500 year old vampire who really hates Muslims. This could be a win/win for everybody.' So they reactivate Dracula and this time they're somewhat controlling him, in that they're feeding him some targets. The question is, of course, who's controlling whom? Is Dracula just playing along, has Edom finally found a way to weaponize Dracula, and how much collateral damage is it allowing, because it seems like it's an awful lot. It all becomes yet another great success for Operation Edom. The 2011 analyst further annotates Stoker's manuscript, and then disappears. Gauntlett: A lot of people are going to get the 1890s connection, the World War Two connection, and the modern day, but why did you opt for a 1970s British spy storyline as well? Hite: First of all, I wanted to get that Len Deighton, John le CarrÃ© mole hunt paranoia spy thriller connection. I'm a huge le CarrÃ© fan, I thought the recent Tinker, Tailor movie was terrific, but in addition that era is important in the British history of espionage. It's right after the Cambridge Five [Soviet double-agent] scandals are finally beginning to detonate, and the intelligence community is beginning to realize that all of its problems didn't go away with Kim Philby. There's a lot of retrenching and looking around for people to blame, which is what le CarrÃ© picked up on, and you've also, providentially, got a big earthquake in Romania in 1977. Since Stoker draws a connection between Dracula and earthquakes, I sort of drew it out a little further in the course of the Dracula Dossier. It turns out, according to the research, there's a big earthquake in Romania in 1940, there's another in 1977, and a third in 2011, so those all seemed to point me towards the period! Also, if you were to go all the way back to 1894, or even 1940, you are dealing with very old NPCs! I needed at least one more generation to play with, and the mole hunt is the perfect, tangled mystery. Nobody knows what's going on, which makes it perfect for a Director to use to create doubt and uncertainty. The Director's going to know whether or not Romania went to the Axis, but there is no way to know whether there was an actual mole, or whether they found the right mole. There's still plenty of argument over the identity of the fifth man in the Cambridge Five, or whether or not Oldfield was a mole, and that's part of what this project is commenting on. This kind of Watching the Watchmen problem isn't just a British thing, but obviously in this case it's the British who brought Dracula onto their shores!